Cruise tourism rose more than four times from last year. Carnival Paradise in Havana. CUBA STANDARD — A devastating hurricane and new travel restrictions by the Trump administration notwithstanding, Cuba achieved 19.7% growth in the number of visitors through November, putting it on course to easily shatter last year’s record. Through November, 4.257 million visitors from abroad set foot in Cuba, Tourism Minister Manuel Marrero told the National Assembly in its year-end session. This includes 397,500 cruise tourists, more than four times the number last year. However, the red-hot boom may be cooling to yellow levels, as visitor numbers declined in September, November and December compared to last year. Marrero did not provide any details; Cuba’s National Statistics Office (ONE) stopped publishing visitor numbers in December last year. The minister blamed wrong perceptions of damage by Hurricane Irma among tourists and tour operators. He did not mention tightened U.S. travel rules, but anecdotal evidence shows that the U.S. visitor boom has cooled somewhat since the Trump administration took an adversarial attitude towards Cuba since September. From January through November this year, 965,676 U.S. visitors arrived in Cuba — 189.7% more than in 2016, a Cuban foreign ministry official said earlier this month. That included 579,288 non-Cuban Americans (+248.7%) and 386,388 Cubans living in the United States (+140%). Even though U.S. visitor growth seems to continue at two-digit rates, the numbers are a slowdown from the 300-plus growth rates in the first half of this year. Also, tourism revenues are lower than expected, Marrero said, due to a slumping Canadian dollar. Although the number of visitors from the United States nearly surpassed Canadians this year, Canada still is Cuba’s No. 1 tourism source market. Also, the bottom line of state tourism companies has been affected by Hurricane Irma, although all hotels have insurance coverage, according to Marrero. The quality of Cuban tourism services has improved, he said, with 90.9% of tourists likely to return and recommend Cuba as a destination to family and friends. 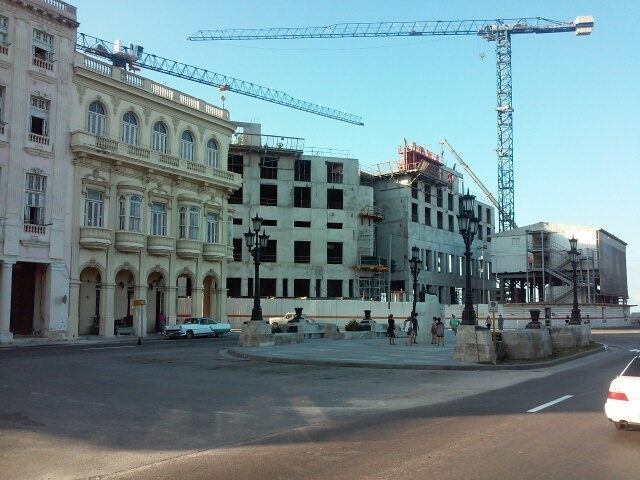 Prado y Malecón: A Gaviota property currently under construction. 78% of planned tourism investments are on track. 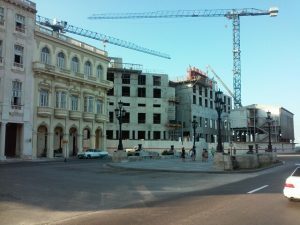 Investments in hotels and other infrastructure — by far most of them shouldered by Cuban state companies — have reached 78% of original plans for this year, according to Marrero. He blamed “bad preparation of construction projects” and delays in supplies of rental cars. While a 22% lag in investments may not look good, it is much better than last year, when only half of planned tourism projects were actually completed, according to observers. In the mid-term, Cuba would like to build at least 29 hotels just in and around Havana. This entry was posted on Thursday, December 21st, 2017 at 11:05 am	and is filed under Economy. You can follow any responses to this entry through the RSS 2.0 feed. Both comments and pings are currently closed.